Justify was a near-unanimous choice Thursday in a random sampling of Santa Anita-based trainers to win the 150th Belmont Stakes Saturday and become history’s 13th Triple Crown winner. 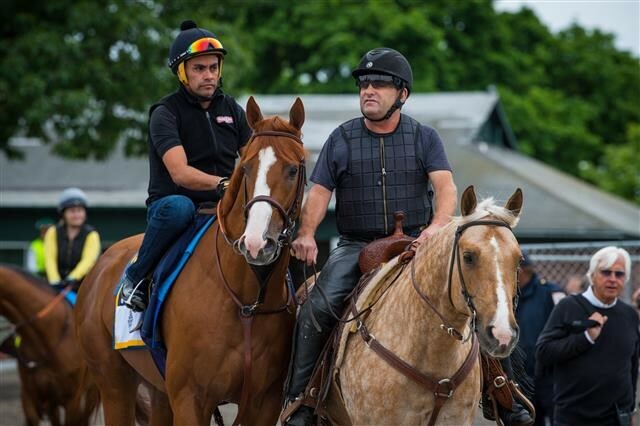 Trainers from A (Paul Aguirre) to Z (Howard Zucker) all were on board with Justify, undefeated winner of the Santa Anita Derby, Kentucky Derby and Preakness Stakes, and 4-5 morning line favorite to conquer nine rivals in the mile-and-a-half Belmont. Paul Aguirre, Richard Baltas, Ray Bell, David Bernstein, Jeff Bonde, Jack Carava, James Cassidy, Matt Chew, Phil D’Amato, Caesar Dominguez, Paddy Gallagher, Mark Glatt, Jorge Gutierrez, David Hofmans, Jerry Hollendorfer, Steven Knapp, Brian Koriner, Eric Kruljac, Andrew Lerner, Jeff Metz, Hector Palma, Dean Pederson, Jorge Periban, Gary Sherlock, Gary Stute, Eddie Truman, Kathy Walsh, Tim Yakteen and Howard Zucker all were in support of Justify. About the only dissenter was Dan Hendricks, who opted for Bill Mott trainee Hofburg. Justify won the Kentucky Derby and the Preakness Stakes. NBC-TV’s national telecast will air from 1 p.m. to 4:15 p.m. Pacific Time, with scheduled post time for the Belmont at 3:46 p.m.
Only 12 horses have swept the Triple Crown: Sir Barton (1919), Gallant Fox (1930), Omaha (1935), War Admiral (1937), Whirlaway (1941), Count Fleet (1943), Assault (1946), Citation (1948), Secretariat (1973), Seattle Slew (1977), Affirmed (1978) and, most recently, the Baffert-trained American Pharoah (2015). The Belmont Stakes field could possibly be comprised of the following 11 horses (with trainer): Bandua (Dermot Weld), Blended Citizen (Doug O’Neill), Bravazo (Lukas), Free Drop Billy (Romans), Gronkowski (Chad Brown), Hofburg (Bill Mott), Justify (Baffert), Noble Indy (Todd Pletcher), Restoring Hope (Baffert), Tenfold (Asmussen) and Vino Rosso (Pletcher). The Belmont Stakes is an American Grade I stakes Thoroughbred horse race held every June at Belmont Park in Elmont, New York. It is a 1.5-mile-long (2.4 km) horse race, open to three-year-old Thoroughbreds. Colts and geldings carry a weight of 126 pounds (57 kg); fillies carry 121 pounds (55 kg). The race, nicknamed The Test of the Champion, and The Run for the Carnations, is the third and final leg of the Triple Crown and is held five weeks after the Kentucky Derby and three weeks after the Preakness Stakes. The 1973 Belmont Stakes and Triple Crown winner Secretariat holds the mile and a half stakes record (which is also a track and world record on dirt) of 2:24.